I grew up in a household where watching football was our second nature. Every Saturday and Sunday during the fall meant huge feasts of grilled burgers, hot dogs, bbq and always a great time. We loved both tailgating and having parties at home, also known as #HOMEGATING. Those are some of my favorite memories to date. Super Bowl Sunday was all that and much more.We would have a huge homegating party with the entire family. One of my favorite football foods is perfectly cooked chicken wings. I crave the flavor combination of spicy buffalo wing sauce, cooled down by a creamy ranch. 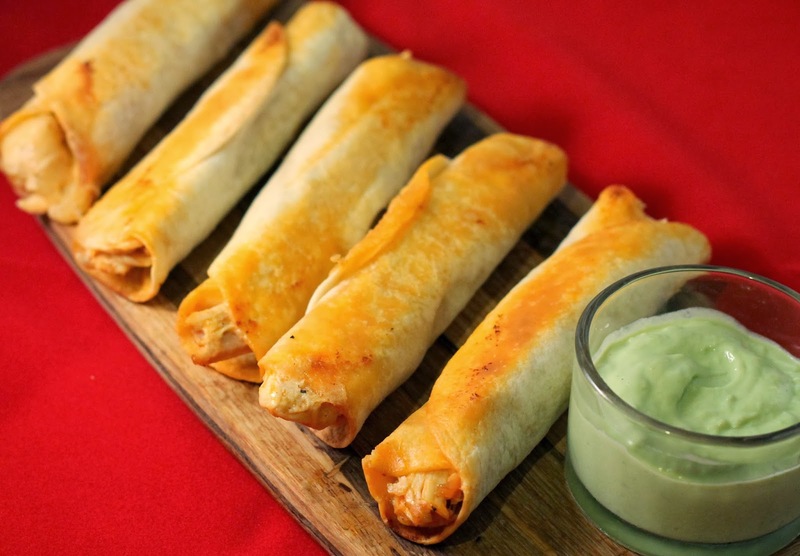 This year, I decided to try something a little different out and make a dish seen all over pinterest - Baked Buffalo Chicken Taquitos. Instead of a traditional ranch dipping sauce, I combined Wholly Guacamole and light ranch. Make sure you enter the #HOMEGATING giveaway below for a cooler full of Wholly Guacamole goodness! Gabe freaked out over this dish. He also thought they were fried and didn't believe me when I explained that they were baked. I modified the original recipe I found online a bit and this is now a keeper recipe in our house. Preheat oven to 425 degrees. In a small sauce pot over medium low heat, melt butter. Add Cavenders, garlic powder and Cajun seasoning. Stir to combine and cook for 1 minute. Add cream cheese and 1 cup of the mozzarella cheese. Stir until melted and completely combined with butter and spices, add a tablespoon of milk if needed. Whisk in hot sauce and milk and simmer for 5 – 8 minutes. Add salt to taste. Combine chicken and sauce. Lay out a tortilla; fill with about 1/4 cup chicken and 2 tablespoons of mozzarella cheese. 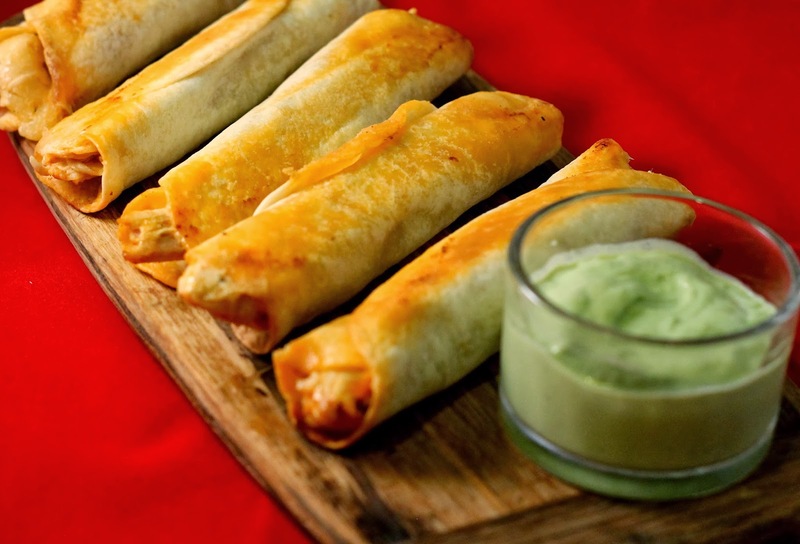 Tightly roll up taquito and place on a greased baking sheet; repeat until chicken is gone. Spray taquitos with oil on all sides. Bake for 15 – 18 minutes; rotate them every 5 minutes, until golden brown. Now for the giveaway! Wholly Guacamole wants to help you with #HOMEGATING by giving one of my lucky readers a cooler full of Wholly Guacamole products, a wholly guacamole t-shirt and various promotional items. Leave a comment below letting me know what your favorite food to eat while watching football. Make sure you enter via the rafflecopter widget below. I make an amazing buffalo chicken dip that everyone loves....including myself!! Mmm, I want these taquitos, NOW! I love guac and wings for the game! I make a dip with cream cheese, BBQ sauce, bacon, tomatoes, green onions, bell peppers, and shredded cheddar. Everyone loves that with Fritos! We enjoy eating Buffalo Hot Wings! These look incredible! I love eating tortilla chips with salsa and guac!! Chips with all sorts of dips! Yummy!